With these words, set down in 1887, the North Carolina General Assembly articulated the mission of the State Museum. The Museum’s origins can be traced back further, to 1879, when the merger of the state’s agricultural and geological collections planted the seed for what would eventually blossom into the largest museum of its kind in the Southeast. A pair of English immigrants guided the institution’s growth through the first half century, firmly setting the Museum’s roots in a nurturing blend of research and collections, education and conservation..
Herbert Hutchinson Brimley and Clement Samuel Brimley grew up in the collecting tradition of middle-class England. In 1880, a chance meeting with a U.S. Department of Agriculture recruiter convinced them that North Carolina held great promise for hard-working, genteel folk like themselves. The young men soon made their way to Raleigh, thrilled to discover new frontiers for their natural history investigations. 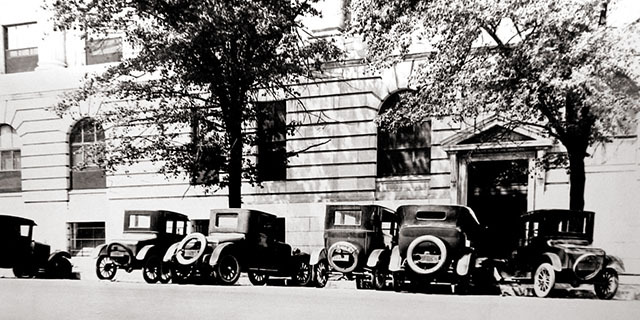 The brothers served North Carolina in separate capacities for nearly 60 years. H. H. was a hunter-naturalist who pioneered interpretive exhibitions and educational programs at the State Museum; C. S. was a scientist-collector who painstakingly built the zoological collections that informed his brother’s public offerings. Their careers laid two paths the Museum would follow for the next 125 years. In a terse piece of legislation, the General Assembly creates the North Carolina State Museum, combining the collections of State Geologist Washington Caruthers Kerr (rocks, minerals, fossils, and woods) and Commissioner of Agriculture Col. Leonidas LaFayette Polk (agricultural products) under one roof. One year later, the Brimleys arrive and begin making their living by collecting bird skins and eggs for the wealthy men of the city. H. H. continues his outstanding work when he articulates and exhibits the skeleton of Mayflower—a 50-foot right whale taken near Shackleford Banks. The specimen marks the beginning of the Museum’s mammal collection. He also constructs an exhibit showing opossums in their natural habitat—one of the first of its kind in the Southeast. H. H. and others found the Audubon Society of North Carolina. They draft the state’s first wildlife and conservation bill and encourage its adoption by the N.C. General Assembly in 1903. H. H. uses a stereopticon to present talks on farming and tourism. The Museum receives an 18-inch-thick cross-section of a bald cypress log from a N.C. swamp. Brimley estimates the age of the tree to be more than 900 years old; in other words, “when Columbus discovered America, it was large enough to have been made into a good sized dug-out canoe.” The item attracted the attention of foresters across the country. In 1919, the Brimleys and T. Gilbert Pearson write Birds of North Carolina, one of the South’s first state bird books. A 55-foot long, 55-ton adult sperm whale washes ashore in Wrightsville in 1928. H. H. overcomes numerous obstacles to procure the whale, nicknamed Trouble (PDF), and prepare the skeleton for display. He calls it “the most outstanding and valuable individual specimen the Museum has ever secured.” Trouble’s image later inspires the Museum’s logo. Outreach efforts continue as H. H. delivers the Museum’s first slide lectures to the public, and participates in weekly natural history programs on WPTF radio. New Museum Director Harry Davis, alongside Director Emeritus H. H., leads the archeological development of Town Creek Indian Mound in Montgomery County, now a state Historic Site. The Museum installs its first interactive exhibit, a specimen of flexible sandstone that visitors flex by turning a crank. C. S. accounts for more than 9,600 insect species in his 1938 book, The Insects of North Carolina. Davis serves the country during World War II, helping locate and identify natural resources vital to the war effort. Specimens such as bauxite, mica, chromite, and olivine are later featured as minerals of wartime importance in a geological exhibit. Museum circulars educate the public about topics from “Important Honey Plants of NC” to “Some Common Harmless Snakes of NC.” The Brimley brothers die within three months of each other in 1946, having shaped the state’s collections and public perceptions through six decades of great change. Following World War II, cell biology and biochemistry become the focus of biological research, and universities across the country begin transferring their natural history collections to research museums. The influx of specimens quickly outgrows Museum confines, forcing collections into nooks and crannies of staff basements, labs, and even a former ballroom. Education takes the forefront with Director William Hamnett, as he emphasizes direct service to teachers and students. Hamnett teaches freshwater biology to fifth graders on field trips to state parks, and delivers natural history lectures to students and teachers in the Museum’s lecture hall. In 1964 an amazing creature arrives in a suitcase from South Vietnam—a 15-foot Burmese Python named George by the soldiers who rescued it from people who intended to eat it. 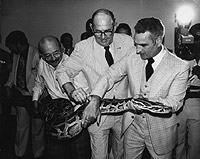 Hamnett agrees to exhibit George temporarily, not realizing that the snake will remain a main visitor attraction until its death nearly 30 years later. Educational efforts expand further as the Museum distributes a collection of traveling exhibits or "black boxes" to schools, clubs, and camps statewide. The boxes contain bird and mammal mounts, slides, film strips, and one motion picture titled "Your State Museum." Museum staff members help develop school nature trails, give nature programs for school groups, and conduct teacher workshops. The Museum also offers short courses in collaboration with N.C. Botanical Garden, and Sandwich Matinees for office workers who want to watch a nature movie while enjoying a bag lunch. Ray Ashton takes the helm in the late ’70s and hires Mary Ann Brittain, who begins recruiting and training docents to present Curiosity Classes for visiting school groups. 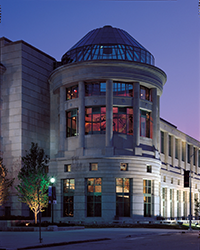 The American Association of Museums accredits the Museum in 1979, recognizing the achievement of professional standards in collections and services. Under Brittain’s guidance school programs grow and begin to emphasize serving visiting school groups, helping educators learn about natural sciences, and incorporating science lessons into everyday classroom activities. Public programs, headed by Jesse Perry, take a big leap forward with the introduction of thematic events that later evolve into the immensely popular Astronomy Day, Reptile and Amphibian Day, and BuGFest! 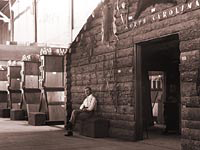 In recognition of its emphasis on natural sciences and conservation, in 1983 the Museum is transferred from the Department of Agriculture to the Department of Environment and Natural Resources. Museum educator M.T. 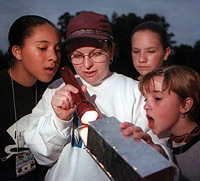 Fore shares a night walk with participants in the Girls in Science summer camp, begun in the 1990s. As the decade opens, Dr. Betsy Bennett becomes the Museum’s director. A short time later, Duke University donates its vast collection of NC freshwater fauna to the Museum, nearly doubling Museum holdings. Further additions from the NC Institute of Marine Science and other institutions push Museum collections past 1 million specimens. The Museum is bursting at the seams, and Bennett leads a long-desired push for expansion. In 1995, Governor James Hunt launches the Museum’s campaign for new exhibits, which eventually raises $36 million. The Research Lab is completed in 1998, giving collections climate-controlled room in which to grow. The search for specimens to enhance the new Museum yields spectacular finds. The Museum acquires a 3-million-year-old set of teeth from a 43-foot shark (Carcharadon megalodon) discovered in Beaufort County, and a 110-million-year-old carnivorous dinosaur and denizen of the Southeast, Acrocanthosaurus atokensis, which is destined for the new building’s cornerstone “Terror of the South” exhibit, and remains the only fossil of its kind on display in the world. 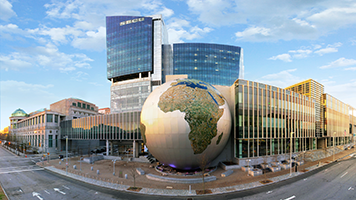 The new North Carolina Museum of Natural Sciences opens to a huge fanfare in April 2000 — immediately becoming the largest natural history museum in the Southeast. Since that time, more than 10 million people have explored the amazing array of exhibits. New technologies now add to the visitor experience, ranging from Web-based interactives and a 256- seat, high-definition movie theater, to a distance-learning classroom that broadcasts to teachers and students statewide and beyond. Like Brimley, Bennett thrives on change, and continues to raise funds to enhance and extend the Museum’s reach. The N.C. Museum of Forestry in Whiteville, established as a satellite facility in 2000, continues to create exhibits and programming with guidance and support from Museum staff. Prairie Ridge Ecostation for Wildlife and Learning opens in 2004. Initially led by Brittain, this outdoor education station just west of downtown Raleigh boasts 38 acres of restored grasslands, wetlands and forested bottomlands interspersed with a winding series of hiking trails, while an outdoor classroom provides an unobtrusive vantage over the scene. The innovative Nature Research Center opens in April 2012 on the block adjacent to the existing Museum. A mixture of visitor destination, research hub and hands-on student laboratory, the facility spotlights current scientific research, empowers science educators, and fosters students’ fascination with science. The opening of the new wing helps boost Museum attendance to more than 1.2 million that year, making it the most-visited cultural attraction in the state for the first time in its history. 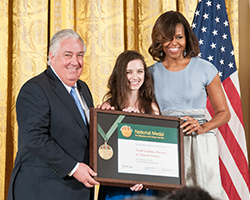 In 2014, the Museum is awarded a National Medal for Museum and Library Service, the nation’s highest honor given to museums and libraries for service to the community. The National Medal is presented to Koster by First Lady Michelle Obama at a special ceremony at the White House in May. And in October, the Museum serves as host institution for the annual conference of the Association of Science-Technology Centers, welcoming more than 1,700 delegates from approximately 45 countries. The new NC Museum of Natural Sciences in Whiteville (former Museum of Forestry) opens in February 2015, redesigned as an indoor-outdoor learning center for exploring science and nature. Modeled after successful Museum programs, the new facility includes an Investigate Lab where visitors participate in hands-on activities using state-of- the-art scientific tools, and a Nature PlaySpace that blends natural and man-made play components in a safe environment. The power to reach the curious has grown in ways H.H. Brimley would have had a hard time predicting. But the change that he demanded and the momentum that has gathered force continue to drive the Museum as it now delves into the reflective questions of: What do we know?, How do we know?, What is happening now?, and How can I participate? And its staff continue to provide the means by which those who connect with the Museum — whether onsite, offsite, online or outside — can move from curiosity to interest to engagement to action.